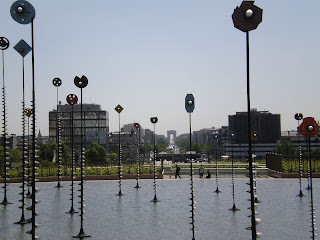 Even though Paris is a lot about the history with the whole, big old town and its beautiful, old houses and gardens, there is a modern part of the city too. 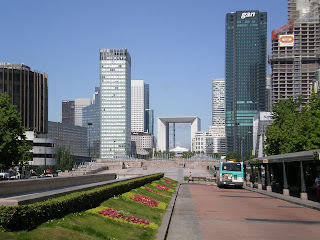 It's called La Défence and is located in the north-west of Paris. Yesterday me and Liss went to explore it and I have to say I really loved it. It's so different from the rest of the city! And since the whole of the main area is only for pedestrians, it's also so very calm. You don't hear nor see any traffic. But in the same time, you can gaze at the Eiffeltower, the Arc de Triomphe and a lot of other sights of Paris. They're so close but still if feels like they're so far away. Like they're a scenery in the horrizon while you're sitting in a whole another part of the world. We actually sat for a long time on the stairs of the arch in this part of the city, eating ice cream and enjoying the warmth and the view. And being amazed by the silence. 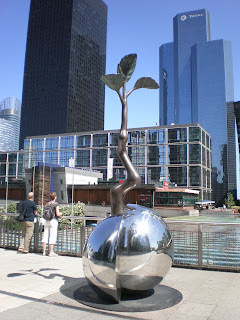 This is a modern piece of art and as you can see, there's a straight view to the Arc de Triomphe. In the evening we were invited to a picknick by the Seine, on the promenade by the water that I've shown you a few pictures from. This is another part of Paris where people gather around to hang out with friends. Our group actually ended up quite big as more and more people joined it. Most of them were italians, though, since the organiser was italian and therefor the discussion was very lively and loud :) But it was a very nice way of spending a friday evening! It really felt like summer. And I love summer.